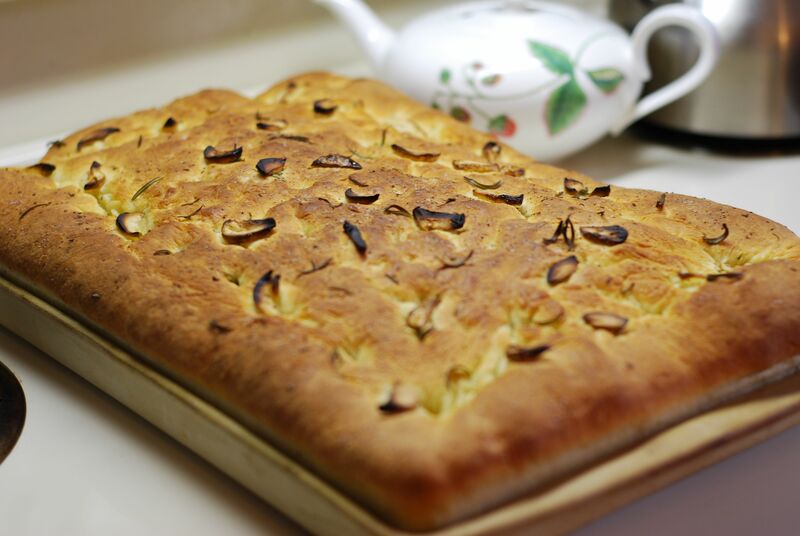 This recipe is adapted from Thyme Focaccia and Parmesan Focaccia on Epicurious’s website. These directions utilize a bread machine to make the dough. If you do not have a bread machine, please refer to the Epicurious recipe for directions to make dough using a standing electric mixer. 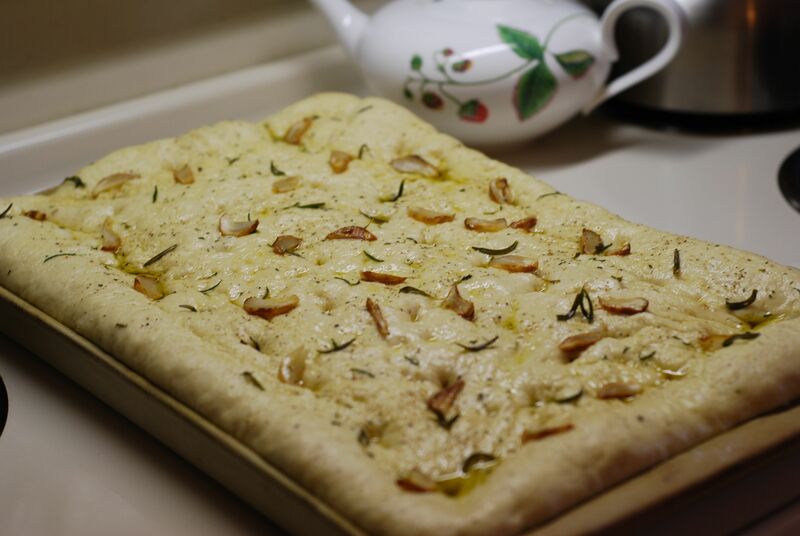 * This Focaccia recipe is a great way to utilize the garlic and rosemary that is used to make the Rosemary Garlic Oil but fresh rosemary and garlic could also be used. Just note that the flavors will be slightly sharper using fresh versus cooked. NOTE: If your bread machine specifies a particular method to adding ingredients, follow the directions of your machine. My bread machine is a Williams-Sonoma brand and recommends adding liquids first, followed by flour, then other dry ingredients. Pour warm water and olive oil into bread machine pan. Be aware that the temperature of the oil will affect the temperature of the water, so if the oil is slightly cool, you should have your water on the warmer side. Carefully add the flour to the pan, trying to get the flour to float on top of the liquid but cover the surface so you can no longer see the liquid. In the center of the pan, where the paddle will mix the dough, make an indent in the flour and add the yeast. In one corner, add the sugar and in another corner add the salt. Set the bread machine to just mix the dough and warm to first rising. Be sure that the machine will not mix the dough for the second rising or cook the dough. This process generally will take 1 to 1 ½ hours depending on the bread machine. While dough is being made, prepare an 15 ½”x10” stoneware bar pan (I use the Pampered Chef Stoneware Large Bar Pan) by brushing with 2 Tbls. olive oil, then sprinkle with 2 Tbls. Cornmeal. Alternately, you can make 2 smaller loaves. Set pans aside in a warm place (cold pans will inhibit the second rising). The prepared dough will be very soft and moist. Remove dough from bread machine and pour out onto a floured surface. Do not knead dough. Using floured hands, press dough flat to about 1-inch thick. 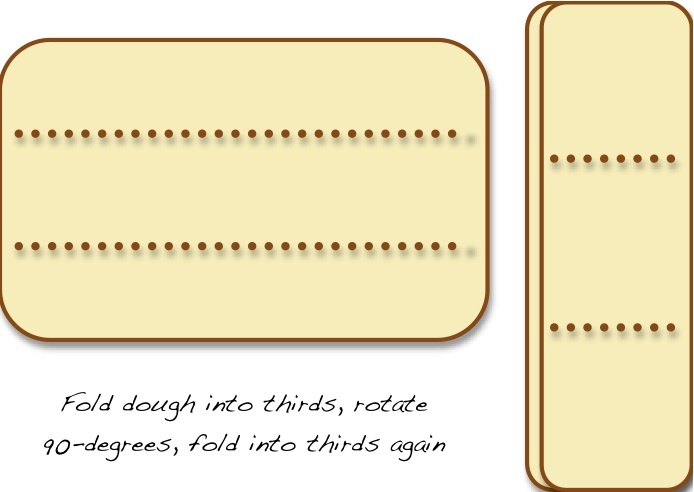 Fold dough into thirds. Press lightly and turn 90-degrees. Fold dough into thirds again. NOTE: The purpose of the folding is to create layers in the dough. During the second rising fine air pockets will form and the dough will become lighter and fluffier when cooked. Using a rolling pin, roll dough into a flat rectangular shape, slightly larger than the pan. Carefully transfer dough from table surface into prepared pan, pushing the dough into the pan around the sides so it fills the whole pan. Don’t worry about wrinkles in the dough. Brush the dough with the Rosemary Garlic Olive Oil. Top the Focaccia with roasted rosemary leaves and slices of roasted garlic. Lastly, sprinkle coarsely ground salt and pepper. Set aside in a warm place for 30 minutes for second rising. Preheat oven to 400° (375° if your oven runs hot) Using your finger, press indents about every 3-4 inches apart all over bread. Bake the bread for 12-14 minutes. 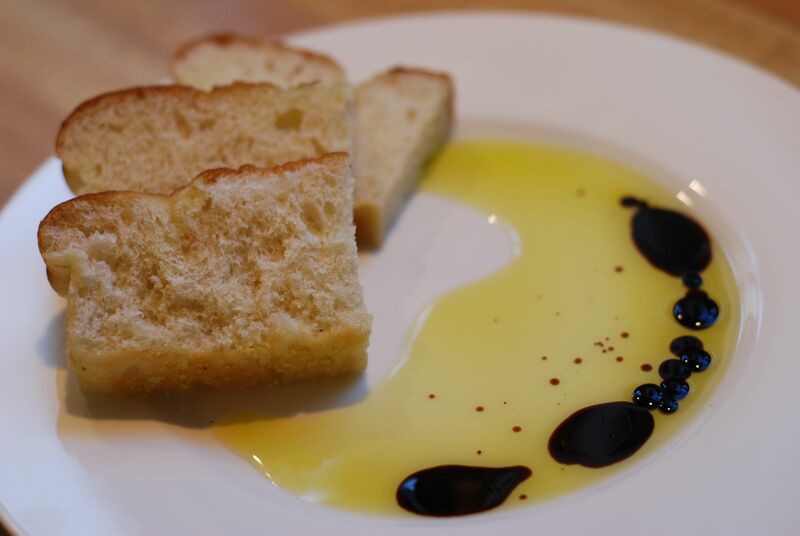 SERVING SUGGESTIONS: Try this focaccia with a drizzle of Rosemary Garlic Oil and Balsamic Glaze. Top slices of rosemary and garlic focaccia with goat cheese, roasted beets, and chives. 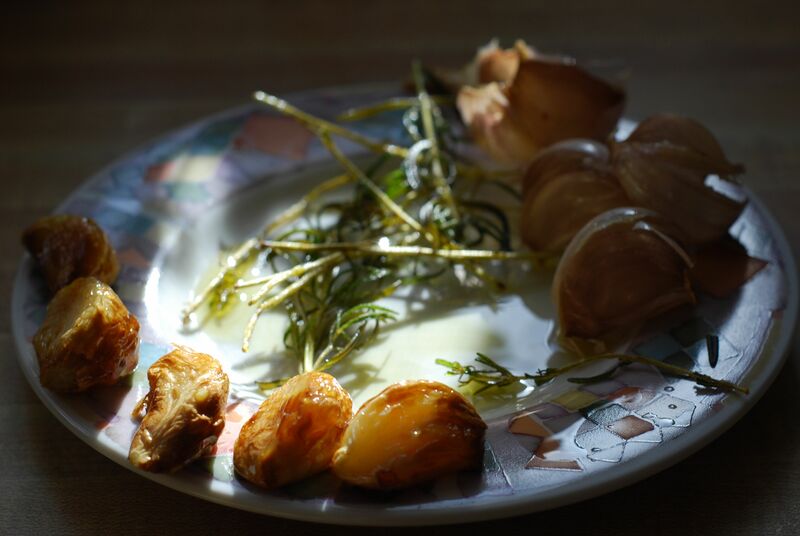 You are currently reading Rosemary and Garlic Focaccia at Hestina's Kardia.